Joan Didion wrote, “We tell ourselves stories in order to live.” But how do we make sense of a world in disorder? Richard Patterson reviews. 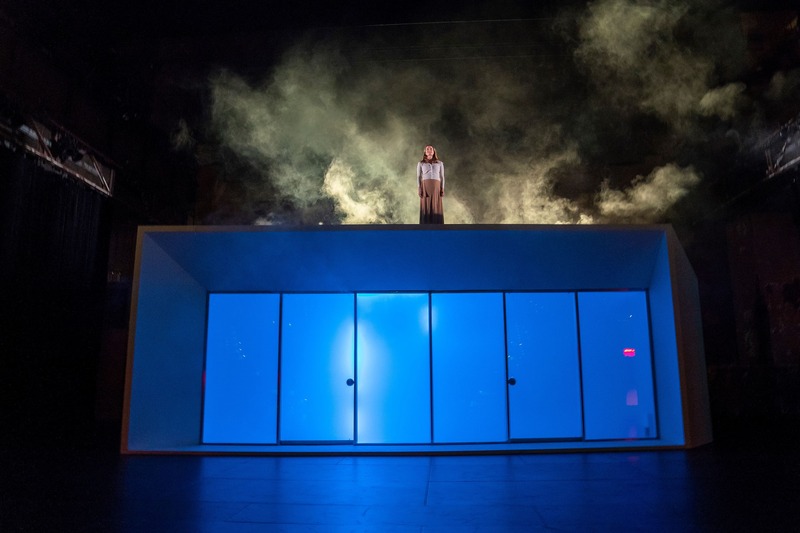 It’s easy to see why director Lars Jan (and his performance/art lab Early Morning Opera) has fixed its gaze on Joan Didion’s essay “The White Album” for the foundation of his latest production of the same name, part of BAM’s Next Wave Festival. The essay, written during the ten-year period from 1968 to 1978, focuses on the tail end of the ‘60s, embodied not only by culture and large-scale political movements (including the Doors, the Black Panthers, and a number of student protests) but by the seemingly senseless Manson Family murders that shook the nation’s consciousness. Its opening sentence is one for the ages: “We tell ourselves stories in order to live.” Didion set for herself a nearly impossible task with the piece: to portray disorder and break down the notion of narrative as a means of “making sense,” within the recognizable structure of an essay. In this case, the work is split into fifteen parts that address then-current events, true crime, and the author’s own psychological state of mind, among other subjects. In framing a work of theatre around the essay, as performed by actress Mia Barron (Jan’s partner in real life and a co-creator of the piece), with help from four other actors and a chorus of local students, artists, and activists who have been enlisted by the production, Jan captures the kaleidoscopic quality of Didion’s piece. The focus throughout is on Barron, who straightforwardly delivers the essay, mainly downstage, while upstage a rectangular structure serves as the playing ground where the other actors jump in to act out complementary quotes and scenes (the sleek architectural design is by P-A-T-T-E-R-N-S Architecture). While Barron provides the calm, cool center of the piece, Jan’s use of the rest of the cast is somewhat less successful. An attempt has been made to include a diverse slate of actors to reflect Didion’s subjects, some of whom are black (the essay’s blind spots regarding issues of race are spotlighted in a program essay by dramaturg David Bruin), but despite the talent of those surrounding Barron, the flurry of sound and activity onstage–mainly in the form of brief lines of dialogue but occasionally (and more successfully) through snippets of music from the period performed by the talented Sharon Udoh–distracts from the power of the piece more than it adds to it. When considering Didion in the theatre, it’s difficult to stave off memories of her own commendable stage adaptation of the 2005 memoir The Year of Magical Thinking, which premiered on Broadway in 2007, starring Vanessa Redgrave as Didion. Directed by David Hare, that play fixed a laser focus on the author’s words by putting Redgrave front and center with barebones physical elements. Jan seems to think that more is more, but fails to realize that Didion’s words as interpreted by Barron, along with some smart design choices, like sliding doors (so evocative of California living, even in their simplicity), make most of the magic. In chronicling the tumult of her times, Didion forced her own gaze into the fire, acknowledging the randomness of life that can’t be easily tamed, tamped down, or boxed in. At its most successful, Jan’s work on The White Album reminds an audience why Didion’s essay has endured, in spite of its hyper-specific subject matter. It’s hard not to look at our own twenty-four-hour news culture with the same bewildered gaze, wondering what possible neat package could encompass so much chaos. The stories we tell ourselves to live, though, are are so often crafted in solitude that one wonders how Jan’s piece might have been further sharpened were its focus even tighter than it is in this creditable production.